Yellagonga Regional Park is a ribbon of mostly bush around Lake Joondalup and Lake Goollelal in the northern suburbs. It's a great option for family rides. Pretty flat with plenty of playgrounds, picnic spots and a mix of bush and open paddocky areas. At the northern end of Lake Joondalup you'll find Botanic Mini Golf. The course is well maintained and spread over a couple of hectares so expect to spend a couple of hours if you're playing. Leapfrogs, a busy restaurant flogging everything from devonshire teas to woodfired pizza, is a part of the complex. Sadly the bike hire that was a part of the complex was closed recently. Ride round the lakes and you'll be alternately plunged into pockets of tuart forest, pedalling past suburbia. Keep an eye peeled as you cross Hocking Road for the Galaxy Drive-In, now the only operating drive-in in the Perth metro area. Friends of Yellagonga's website reports that 122 bird species frequent the lakes and swamps. The park is super easy access by car and train, and yes, by bike. There are big carparks associated with Neil Hawkins Park on the west side of the lake, Opportunity Playground on the east side. Head up freeway north and exit east on Ocean Reef Road or Burns Beach Road.Pretty much the same story if your want to ride there; the freeway path is pretty good once you're north of Cedric St. This is a big lake surrounded for the most part by suburbia. There are endless car parking opportunities pretty much the whole way round. No fewer than three train stations service the park which means you can ride one side of the lake and go home via a different sation. The easiest, quietest and safest route to the park from the train is from Greenwood Station. Leaving the station ride north on the Principal Shared Path. About 500 metres north of the station there is a clearly signposted turn to the east. This path will take you direct to Lake Goollelal. Road crossings on this path are all by bridge or subway save for the very last one. There aren't even any driveways to cross - urban design at it's best! Not such a great story if you're getting off at or returning from Edgewater or Currambine stations. 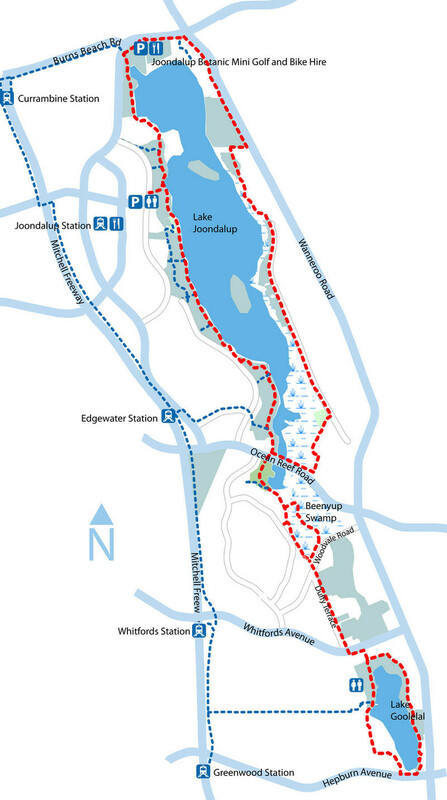 From Edgewater I suggest heading north-east out of the station through the carpark, crossing Joondalup Drive and travelling east to the lake on Wedgewood Drive which runs on the south side of the park you can see from the station. You could take the bike path south a couple of hundred metres and travel on the path adjacent to Ocean Reef Road but the 80km/h traffic tearing past is distinctly unrelaxing. Same story if you're hopping on or off at Currambine. Although Burns Beach Road is not quite as busy as Ocean Reef you will have to contend with crossing the roundabout at the junction of Burns Beach Road and Joondalup Drive - urban design at it's most pedestrian and cycle unfriendly. If you're riding to the park from points south you'll want to follow the freeway PSP and peel off just north of Greenwood Station as described above. From other points you can approach through suburban streets or alongside any of the local arterials, as long as you're north of Hepburn Avenue and south of Burns Beach Road you can't miss the park. 1. On pulling out of the Golf Course car park, beware the very new and nice looking path you will see on your right straight away. As of December 2011, that track terminates at a fence. 2. A 3L Camelbak (HAWG or MULE) will just make it, if the mercury is into the mid-30s. Attempting to refill at Neil Hawkins Park will see you receive some rather impressive death glares from parents so I recommend packing some spare water in case you run dry. 3. As part of our acclimatisation, we did the ride during the hottest period of the day (11am - 1pm). The path has very little overhead shelter so pack sun screen and re-apply often. 4. I move to rename the Karri forest leading up to the Fire Station "Spider Forest of Terror". As an arachnophobic, seeing spiders the size of my hand dangling from webs seemingly as thick as washing line had me screaming like a lost child. Did I mention said hand-sized spiders dangle across the path at head level? 5. The limestone track leading up to Neil Hawkins Park is quite mountain bike friendly - while the climb at the end is murderous on tired legs. 6. There is an ice-cream van at Neil Hawkins Park on hot Saturdays - and he is very generous with his soft serve. Very good for a blood sugar fix. 7. We encountered very few other track users on the day (which can probably be attributed to the temperature and time of day). They were all very friendly - including the lad in aviator glasses riding a BMX, with no water. We pitied him. 8. It was calculated that we burned through 1400 calories on the 16km course - thus opening up the entire menu at Leapfrogs. If you haven't given the beef hamburger a go, you're missing out!